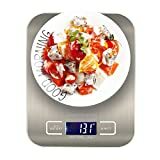 No kitchen is complete without a decent kitchen scale as everything that you do in the kitchen requires measurements and usually all recipe ingredients would go by weight. 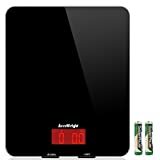 You can therefore go for a digital kitchen scale or a manual one however digital kitchen scales are preferred nowadays given their ease of use. 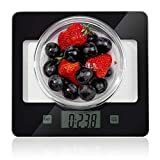 Below are some of the most popular ranges of digital kitchen scales for your reference. THE UK'S NO. 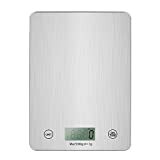 1 BRAND FOR KITCHEN AND BATHROOM SCALES - Salter Housewares began life in 1760 and has continued to grow and thrive within the housewares business ever since, through innovation, accuracy and precision. We're so confident you will love the quality and reliability of our products, we back them with a manufacturer's guarantee for 15 years! THE UK'S NO. 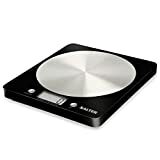 1 BRAND FOR KITCHEN SCALES - Salter Housewares began life in 1760 and has continued to grow and thrive within the housewares business ever since, through innovation, accuracy and precision. We're so confident you will love the quality and reliability of our products, we back them with a manufacturer's guarantee for 15 years! ULTRA-SLIM DESIGN: 21.7x18.7cm STAINLESS STEEL platform about 30% LARGER than other kitchen scales on the market, while still as THIN as 1.8 cm. Also adds a modern aesthetic to your kitchen, durable and easy-to-clean. PRECISE MEASUREMENT: 11lb/5kg capacity with a division of 0.1oz/1g. High precision strain gauge sensors that deliver trustworthy results every time. MULTI-FUNCTION: Features a crystal-clear back-lit LCD display in lb/oz, g, ml, and fl.oz. Low power, overload indication and auto-off function make weighing your foods hassle-free. EASY-TARE FUNCTION: Lets you deduct the weight of a container from the total weight in order to determine the net weight of the contents. Suitable for both dry ingredients and liquids. 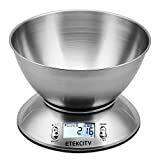 CE, RoHS Certificated, 3 x GP AAA batteries pre-installed; Before weighing wet ingredients, please put a bowl/plate on the scale or cover it with plastic wrap; 2 Year Free Replacement Warranty by Etekcity. Precise Measurement: 11lb/5kg capacity with a division of 0.1oz/1g. High precision strain gauge sensors that deliver trustworthy results every time; LCD display for clear readout in kg(g), lb(oz). 【4 Units】--There are, G,OZ,ML and LB.OZ, 4 different units of measurement in this kitchen scale. You can switch easily by pressing " unit '' button. 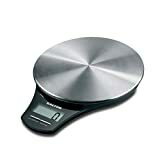 【Tare & Auto-zero functions】--This kitchen scale allow you tare weight of container. Put the container on the platform then press Z/T button, that's all. No more complicated math, and can also control weight precisely. 【Auto-off, Low power, Overload indication】--Kitchen scale will auto shut off after 60s to preserve your battery life. Low power indication remind you to change the battery in time and avoid power off when you use. Overload indication prevent to damage scale if you put overweight items. 【Precise Measurement】-- The capacity of kitchen scale is 5kg (176oz/11lb) with a division of 0.1oz/1g. Can meet your demands of cooking, baking and food preparation. 【Quality Materials】--7.2''X5.5'' stainless steel platform which makes it durable and easy to clean. There are 4 anti-slip mat on the bottom to make it stand stable. THE UK'S NO. 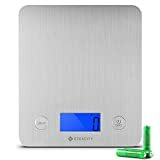 1 BRAND FOR KITCHEN AND BATHROOM SCALES - Salter Housewares began life in 1760 and has continued to grow and thrive within the housewares business ever since, through innovation, accuracy, and precision. We're so confident you will love the quality and reliability of our products, we back them with a manufacturer's guarantee for 15 years! High load capacity up to 11lb/5kg with graduation to 1g / 0.1oz precise,display of measurement results in Lb.oz/g/fl:oz/ml. Advanced sensor technology delivers quick, accurate responses; Large, red, easy to read backlight LCD display. Stylish tempered safety glass platform is not only safe and hygienic but also easy to clean and store. Add & Weigh 'zero' (Tare) function - allows for measurement of multiple ingredients in the same container. Energy-saving auto off function, Low battery and overload indication, powered by 2 AAA batteries. 2 years warranty. 【Accurate scales】The scales came with 2 AAA batteries included and USB rechargeable. They are well made, and they measure accurately. Nice slim design allows you to easily slip this away in a small space when not in use. With a energy-saving auto off function, and low battery and overload indication. 【Save space】It's nice and compact & light, takes up little room .Once the blue protective film has been removed from the top, the scales look smart. Easy to clean and unobtrusive in the kitchen. It's also quite thin (about 1cm), perfect in the kitchen and small enough to store in a drawer. 【Tare Design】Display is digital and clear ,has an easy tare function and auto off feature to save battery. The tare function allows you to zero the scales for the container you are using, and can also be used to weigh multiple ingredients into the same bowl, saving time. 【Easy to use】Just pop the bowl or container onto the scales then press the on button. This will set the scales to zero so the weight of the container is not taken into account when measuring your food. easy to operate and clean which is always important in the kitchen. 【Multi-Function】Scales are neat and precise, you can choose between which units you prefer to measure in, I.e. g ,lb ,oz ,kg ,ml and milk ml. It can weigh tiny quantities (like 1 grams or 2 grams) and a high load capacity up to 10kg , which you need when baking specific fiddly things. Good value and great functionality.  Tempered glass：Stylish and secure design of tempered glass, easy to clean, prevents fingerprints. Slim and compact size for easy storage and carrying.  Tare function: Can reset the current weight on the digital scales to zero, measuring multiple ingredients in the same container to save your time, perfect for baking, cooking, etc.  Auto-off: Weighing kitchen scale automatically turns off after "60" seconds of inactivity to save energy. Easy to read LCD; Battery and overload indicator.  Multiple Warranty: We are committed to 100% customer satisfaction and provide the best products and services - All UROPA HERO electronic kitchen scales are CE / ROHS Certified; 1 x CR2032 batteries included; 1 year free warranty. 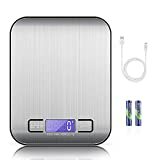 PRECISE MEASUREMENTS: Digital kitchen scales equipped with 4 high precision sensors, 11lb/5kg capacity with a division of 0.2oz/2g, measuring up to 11lb in 1/10oz, 5l in 2ml and 175 fl oz in 1/10fl oz increments, provides you with instant and accurate results. DECENT SENSITIVITY: Sensitive touch control buttons for easy operation and a clear large LCD screen that displays weights in pound, ounce, gram, and milliliter. EASY TO CLEAN: Kitchen weighing scale is premium tempered glass platform, easy to keep clean with a simple wipe. TARE FUNCTION & AUTO OFF: Calculates the net weight of your ingredients or liquid by substracting the weight of any bowl or container, allows for measurement of multiple ingredients in the same container. Auto-off after 1 minute of inactivity to save the battery, powered by CR2032 battery (included). LIFETIME GUARANTEE: If you have any problem please feel free to contact us, will give you a replacement or refund.